That’s one of the most common question writers hear. The simple answer is ideas are everywhere–in overheard snatches of conversation, in dreams, in what you read, in the sight of a woman standing on a pier. What those asking the question fail to understand is an idea is not a novel or even a short story. An idea is merely a starting point. It must be nurtured like a seed to achieve maturity and become something more. It’s like turning up the heat under a pot of water. Some ideas fizzle out before making that transition to something else. The best, the ones that reach maturity, are nourished by imagination, experience and lengthy periods of consideration. Sometimes ideas are rejected when we realize all we’ve done is mimic something that already exists; unless you can put a stamp of originality on it, it may not be worth pursuing. They shine when you realize you have something unique. The best ideas take time to evolve. John Fowles recorded how the genesis of his French Lieutenant’s Woman began with nightmares and images of a haunted woman which persisted until he had to know her story. Seldom do such stories arrive complete in a single flash of inspiration. When an ex-lawman Lute Donnelly sets out on the trail of the ruthless gang of outlaws who murdered his brother, revenge is his only desire. But when he stumbles upon Tom Baskin, a youngster who has been duped into helping the outlaws and then left behind, Lute reluctantly takes the boy under his wing–and begins to find his humanity again. United in a common cause, the pair travel a dangerous trail in search of revenge and redemption. But when Serene McCullough, the widow Donnelly loves, begs him to help her son move the cattle herd gathered by cash-strapped Mormons as their church tithe, he can’t refuse her. When the cutthroat gang kidnaps Serene to bargain for The Tithing Herd, Lute and Tom find themselves pitted against insurmountable odds–with unexpected help coming from an old friend. Bio: A retired newspaper editor, J. R. Lindermuth is the author of 15 novels and a non-fiction regional history. 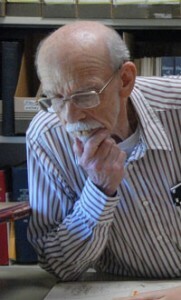 Since retiring, he has served as librarian of his county historical society where he assists patrons with genealogy and research. He lives and writes in a house built by a man who rode with Buffalo Bill Cody. His short stories have appeared in a variety of magazines. He is a member of International Thriller Writers and the Short Mystery Fiction Society, where he served a term as vice president. You are invited to visit his website at: http://www.jrlindermuth.net. I’ve had several short stories published in anthologies. It’s always been a fun experience. The most fun was when MURDER ON WHEELS, by the Austin Mystery Writers with a couple of invited guests won the Silver Falchion at Killer Nashville in 2016. I had served as point person for that one, liaising between the writers and Wildside Press, the publisher. It had been work, but I thought I had a handle on how to put an anthology together. So, when I got a bee in my bonnet, a bee that kept buzzing about the upcoming total solar eclipse, I had an idea I could put a short story anthology together by myself. It turns out that I could, but the process was not without a learning curve! There’s not much money to be made doing short story anthologies. Even if you sell a lot, you’re dividing the money among quite a few people. I had an idea how many stories there should be and how long the book should be so that it could be priced at an amount people could spring for—should they be interested in short stories themed around eclipses. I knew I needed to put out a call for submissions in several places where some people knew me. Those were mainly the Guppy chapter of Sisters in Crime and Short Mystery Fiction Society. I knew we needed to edit the heck out of the stories. Okay, I needed to edit the heck out of them since this was my baby. Also, I knew that time was very tight. The bee started buzzing in about January and the eclipse was going to happen in August. The book needed to come before then. There was no way to move that deadline! I found out I have a friend in Wildside Press. I’ve been part of several anthologies they’ve published, plus they did our award-winning WHEELS in 2015. I took a leap and asked them if they’d like to publish it—rushing it to production and not knowing yet what the stories would be. It was a high point for me when they said they’d do it! I found out that the subject interested a lot of people! I got more submissions that I could have dreamed of. I was hoping I’d get enough to make a decent sized volume. Instead I had to reject some. I worked with Wildside to decide exactly how long to make the book and it’s longer than I had planned, but not too much so. I learned that I hate rejecting stories. There were just too many! I had to reject some very good ones that maybe didn’t play up the theme quite as well, or were too much like some of the others, or were fine stories, but didn’t grab me the way some of them did. I also learned, doing this, how subjective accepting and rejecting are. I was unsure exactly which ones to take at this stage, but went with my gut feelings and plowed ahead. In retrospect, I wish I’d decided to publish two volumes, but by the time that occurred to me, it was getting too late. I found out how useful my habit of keeping things on spreadsheets is. I would have been totally lost without that tool! I learned that a bunch of the writers are enthusiastic promoters. If this volume succeeds in sales, it will be largely because of their efforts. I happened to pick stories from a bunch of go-getters! One extra bonus is that one of the writers, Laura Oles, is adept at writing press releases and gave us a bang-up one. Several of us have picked some relevant charities to donate part or all of our proceeds to, since, as mentioned above, none of us will get rich from this. The inventiveness and generosity of the writers, demonstrated in their stories, was again evident in their charity picks. I can’t not list the writers, and I’d like to list the charities, too. 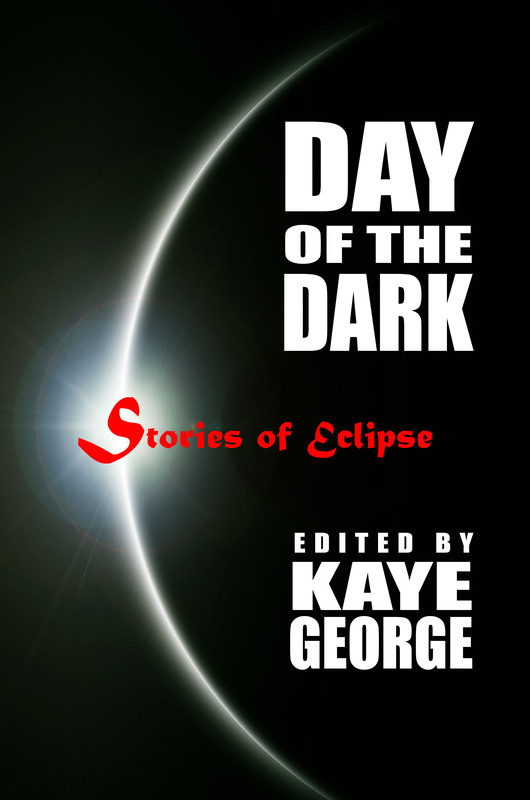 But first, here’s the pre-order link for DAY OF THE DARK: Stories of Eclipse, published July 21st by Wildside Press. Earth and Sky, Petconnect Rescue, Natural Resources Defense Council, Science Center in Finland, DonorsChoose.org, Friends of Goldendale Observatory, Friends of the Earth, Morehead Planetarium, Texas Museum of Science and Techonology, DAPCEP.org for STEM education for future astronomers and scientists in Detroit, and personal friends in need, all in the spirit of light and life. BIO: Kaye George, national-bestselling, multiple-award-winning author, writes five series: Imogene Duckworthy; Cressa Carraway Musical Mysteries; People of the Wind (Neanderthal), the upcoming Vintage Sweets series, and as Janet Cantrell, the Fat Cat series. You can find her short stories in anthologies and magazines, her collection, A Patchwork of Stories, and her own anthology of eclipse stories, DAY OF THE DARK, by Wildside Press, July 2017. 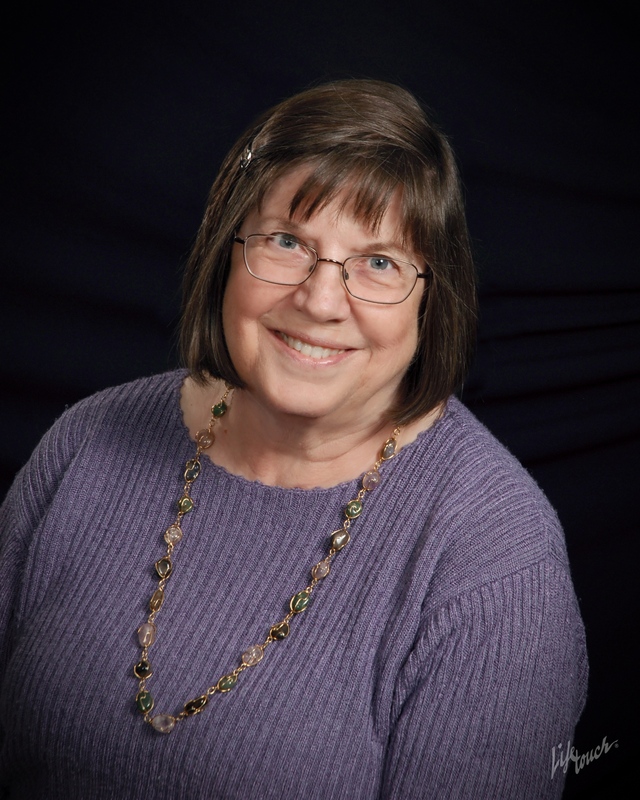 She reviews for Suspense Magazine and lives in Knoxville, TN. A thought came to me recently when looking at the vibrant colouring of the garments and personal adornments shown in two mosaics among those decorating the Church of San Vitale in Ravenna, Italy. This particular pair of mosaics depict the sixth century court in Constantinople, the setting for most of our John, Lord Chamberlain, mysteries. Thus the onlooker sees a crowned Justinian, dressed in imperial purple, his three-pendant cloak clasp resembling a large flower. He takes centre stage, flanked by representatives of church, state, and the military. Is it true to life? Well, a close scrutiny does show distinct traces of a five-o’-clock shadow. In a separate mosaic, Empress Thedora wears a more elaborate crown than Justinian. Also in centre stage, her tunic features an elaborately embroidered hem and she wears a gem-encrusted collar as well as a necklace and earrings. Her face looks drawn, and it’s been speculated shows the first signs of the illness, commonly thought to be cancer, that would ultimately kill her. Richly attired female attendants and a couple of servants round out the picture. Well then, you may ask, what was the thought triggered by these beautiful mosaics? Paper dolls. 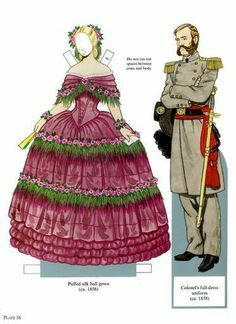 More precisely, character paper dolls for promotional use. What a brilliant idea, the thought modestly continued. An author’s website has only to provide a page or two offering drawings of their characters and appropriate clothing, jewelry, and accessories and the rest is up to those who love their books. It’s worth noting colouring books for adults are extremely popular at present – last year 14 million of them were sold. Authors therefore might consider running off character and accessories pages and wield their staplers to create colouring books as a giveaway for freeby tables at conventions and other mystery-related gatherings. and also helpfully includes a link to downloadable figure templates. Their poses could be altered as necessary, and here I am thinking particularly of the position of the arms. Once these paper dolls are created, the rest is up to your readers, may their colouring pencil sharpeners never get blunt! Mary Reed & Eric Mayer co-write the Lord Chamberlain mystery series, set in and around the sixth century Constantinople court of Emperor Justinian I. The most recent title published was Murder In Megara and they are currently working on the next entry in the series. They also write the Grace Baxter World War Two mystery series under the pen name of Eric Reed.